Welcome to the Carnival Cruises complaints department brought to you by HissingKitty. Experienced poor customer service? We make it easy to file a formal complaint against Carnival Cruises online. Simply use our free form and your feedback will be instantly forwarded for review. Need to contact the Carnival Cruises corporate office? We have the mailing address, phone number, and email address listed below. My husband & I booked our Carnival Cruise for 10/18 for 2 weeks to celebrate our 4 year Wedding Anniversary on the Carnival Spendor. On the web site it showed a pool area with a water slide. Upon boarding the ship we received our daily itinerary which showed the pool and water slide open daily and the hours. We took the elevator to the floor with the pool and water slide. As we approached the area with the pool and water slide we were surprised to find it under construction/and being demolished! We contacted the Guest Help desk to inquire the cause of the mix up...all we received was open ended answers with no resolve. This is not what we paid for and we feel entitled to a refund for 3 days. Our cruise cost us $6,000.00 and we were not notified or informed at any level of the pool and water slide area was closed. More to the point why was the cruise taking place without notifying the passengers. We were looking forward to attending the comedy show and we were unable to find a seat during our two week cruise. Upon observing the way the shows were set up the majority of seats were taken by those who attended earlier shows and did not vacate their seat to offer an opportunity for other passengers to attend. The club area where the comedy show was offered was small; should even the majority of passengers wish to attend it would not accomodate them. The very least Carnival could have done was to vacate the area between shows and reopen to offer a fair means to attend. Lastly I purchased a Ukaleile for my husband to take the class on learning to play the instrument. We went the first day and were turned away by the instructor saying there were not enough seats available and to try the next day. We went again on the 2nd day and was informed the same. We returned on the 3rd day and was told this class was a sequential class and we could not attend. Upon readdressing the circumstances the instructor said we could hang around the classroom and at the end of class we could have a photo copy of the music. We were embarrassed and felt invalidated.Our Cabin on the cruise included a balcony with upgrades. Buyer Beware!!!!! I contacted the Executive office by phone and was offered a $100 on board ship credit for a future cruise. I also sent a registered letter with no answer. We felt as though we we blatantly mislead and would NEVER cruise again!!!! The Executive Office never addressed ANY of the expressed concerns stating that it was our responsiblity to enjoy the cruise. Our purpose to complain was to shed light on the FRAUD that Carnival is aware of and in Florida where their home office is does not even have a BBB rating. I made an appointment in the salon this past weekend while on ecasty. I’m unsure of the beauticians name who colored my hair but she was an African American from North Africa. I was looking forward to being pampered and getting my hair colored. Was charged 170$ for “highlights” that aren’t even noticeable. The only change the stylist did to my hair was fry it off. I was refunded, she offered to perform anything other than hair color free of charge. Was told it would be refunded that day prior to debarmention the charge was still on my bill and had to go to guest services before I could leave the boat and dispute the charge for the 3 rd time. But just doesn’t seem like it was handled professionally or right. Yes I was refunded but my hair is still fried and orange. And now I have no other choice but to walk around in embarrassment until my hair is healthy enough to get fixed. I recently booked a cruise for June 13, 2020 through Toni Anderson Group travel consultant office number 281-406-8778. I never received an invoice or any kind of paperwork regarding the $100 that I paid for myself and for my husband. A few days ago she sent me options for travel insurance. The option that we had to look it was gonna cost $374 for each of us. We are Medicare recipients and we have to have medical insurance because Medicare does not cover us when we are out of the country. We were not aware that it was gonna be that costly so for that reason I canceled the reservation. I was told by Toni in an email that she was not going to refund the $100 that we paid. I am filing a complaint because I want my $100 refunded due to the fact that we were not given complete information initially about the terms of the refund policy. I would greatly appreciate your assistance in this matter. On 27 December, my family and I went on a holiday cruise from Jacksonville to the Bahamas on the Elation. I can honestly say this was the worst experience I’ve ever had on a carnival vacation. We boarded the ship and got unpacked. We arrived at the muster station. The worker asked if we were all together, we said yes, so he scanned 1 card. After the meeting we were told that half of our party had to go to an alternate location to sit thru the directions again because we must have come in late. Apparently, all cards should have been scanned because we had 2 cabins. There were unattended children running up and down the halls outside the staterooms, dining room and Lido deck at all times of the day and night. There was a mechanical problem when we docked a Princess Cay instead of getting off the ship around 8 or 9 we got off at 2 and had to get back by 5. This was very chaotic and unorganized. The scuba diving excursion was cancelled a month or so after we booked the vacation. My husband was very upset because that was one of the main reasons we selected that cruise. I witnessed a blond female bar tender (next to the pizza place) being extremely rude to a young boy. He ordered Dr. Pepper and she brought him sprite. He said he would drink it but she grabbed it and threw it in the sink. He was devastated. The staff on the right side of the dining room (facing the desk) was very attentive and efficient. We were seated on the left side for the last 2 days and the staff on that side was were terrible. They were slow and we had to ask for steak sauce, napkins and silverware several times. The one server who sang the solo on the song (leaving n a fun ship) was the only saving grace he was great but could only do so much. There were some good shows and we enjoyed the sing along but the other services were not up to the Carnival standards we have grown accustomed to. The final straw was when we got fogged in and couldn’t dock in Jacksonville. Bad weather is uncontrollable but the problem was how the situation was handled. Announcements were not made in the staterooms but in hall so not everyone got all the directions or info. We finally heard the announcement directing people to take their belongings and wait on the Lido deck. We did not follow instructions because the elevators were shutoff and we could not lug our bags up the staircase. We finally departed the ship around 2 (6 hours late) after my daughter rescheduled her flight twice. She was stuck in he airport and missed New Years. We were extremely disappointed in several aspects of this Carnival cruise. We were extremely disappointed with several aspects of this Carnival cruise. get for this cruise considering all this inconvenience. Theresa Flowers Myers. Carnival Sunshine, October 28 ,2018 room 8202. I enjoyed some aspects of my carnival cruise but the ship tilting disturbed me. We were in the dining room when the ship rolled hard to one side. I thought we were sinking. I saw water rushing into the dining room. I slept Sunday and Monday nights in my life jacket. I had difficulty sleeping every night of the cruise. My confidence as a first time passenger was shattered. I believed that the ship was actually sinking. Even the fifty dollar credit was not enough. I was still quite shaken. While on board I took my concerns to the front desk. They were helpful and directed me to your department. I understand that ships rarely tilt. I would like to experience a less stressful Carnival cruise. I am asking for compensation in the form of a full refund. On Monday July 23rd, 2018 when my family and I (13 in total) boarded the Carnival Horizon and entered our cabin we immediately called guest services to inquire about the Dr. Seuss breakfast, specifically asking how could we go about making a reservation for it. We were told that they did not have that information as of yet and we could not do it over the phone at that time. That night while checking in for dinner we again asked the person at the check in desk if they knew how we could reserve the Dr. Seuss Breakfast and were told we would have to go to the Steakhouse in person to request this reservation. On Tuesday July 24th I visited the steakhouse and again inquired about the breakfast and was told that no they were not the ones who made those reservations that it would be the main dining hall that handled that. I processed to explain that I had already checked with the people from the main dining hall check in area and were told that it was indeed the steakhouse that would need to make the reservation for us. She again explained that the steakhouse was not the correct place and suggested we call guest services again. When I got back to my cabin I called guest services once again and was told that yes I could make the reservation with them on the phone (in spite of being told on the first day that I could not) and the person proceeded to ask me for my information such as how many people were planning on attending & also which breakfast seating time we preferred. I gave all the information requested & was feeling happy & relieved to finally be able to make this reservation for once and for all only to be told by the person on the phone that the computer was showing that both seatings were fully booked & we would need to be placed on a wait list. Clearly I was very disappointed and upset. My 3 children were even more disappointed as this was one of the main reasons we booked the Carnival Horizon. I explained to the person on the phone that I had been attempting to make this reservation since we first boarded the ship & that I was given the run around and constant misinformation. In spite of that I was told that there was nothing that could be done except placing us on the wait list. On the night before the breakfast we received a notice saying that we were not selected from the wait list and would he unable to attend. This was extremely disappointing as my children were very much looking forward to this event. Adding to our disappointment we spoke with a family that had attended the event & were told that there were many unoccupied tables that day. Not only did this set the tone of our trip it was just the beginning. There were several fights on board the ship and some of the bar tenders were completely rude. The food was also horrible with the exception of the steak house and Asian restaurant. Needless to say I have been on several cruises and have never been so completely and utterly disappointed. I was told the Carnival was a family-fun ship but my family and I did not have the fun we expected to have. I am a very disappointed customer and will be sharing my disappointment with family and friends. Good afternoon I am a travel agent 323643 Sherry Stephens and I had a customer Latijtra Smith and LaRone Moore. They booking number was 1ZDS79 leaving from July 6 2018 on the Victory ship. She went to check in on the 5th of July and they said that her booking was cancel. At first they said she owe 88 dollars. That's why it was cancel. Then they told me that she didn't pay for the trip that she only payed 200 dollars for the deposited. We tried to pay for the trip on MAY 6 2018 by using her visa but she had a 500 dollar limit so the agent told us we can use a check so she did a check for 869.dollars and 92 cent came out of her checking account of May 8th I have the bank statement showing the transaction it was payed to carnival cruise. We did everything we could to get on this ship. They say the ship was full and they could not get her on the ship. The told me that they sent me email saying that the booking was cancel. I did not see it. Once the customer told me that her check was payed we just knew everything was good to go. Would you please look into this I talk to so many people trying to get some help for them. They went to Fl. and just had to stay there till Monday they already had two airlines tickets. So They had to pay extra money to stay in a hotel for those days. My heart went out to her because she was so hard it was their first cruise and she was going with her sibling and she was the only one didn't get to go. 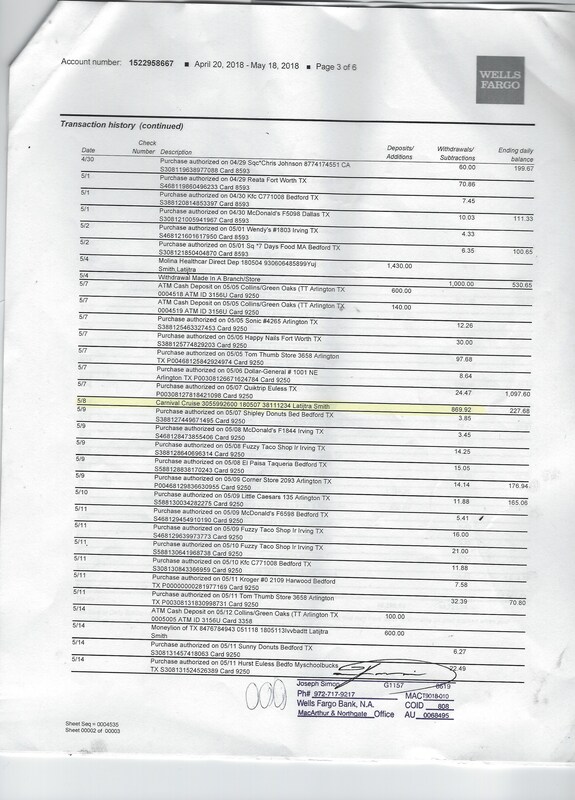 I attaching the bank statement and if you need more let me know. please email or give me a call. syallen64@yahoo.com or 214-293-6398 Thank you so much for trying to take care of this customer. We took a ship excursion and there was heavy traffic so they left us in the middle of Mexico instead of taking us back to the ship's gate. Carnival refused to refund us the $145 for the excursion. We have a party of 24 people (8 rooms) and we booked our cruise nine months in advance to make sure we could get the rooms we wanted/needed for medical reasons. When we called to make our final payment, our joining rooms had been separated causing an issue with the reason we need them together so we asked if we could have an extra room or be upgraded to a suite (from a balcony) so there would be more room and all they could offer us was an inside cabin for $1100. I always hear about people upgrading their room for a small amount of money and we have three platinum members but none of us have ever been offered this deal. I was hoping since this was a mistake on carnivals part, they would be a little bit more accommodating. Unfortunately we have had numerous problems on the last several cruises we have gone on. I don’t mind that there was a mistake made what bothers me is that they’re not willing to make it right. My mom has spent approximately 12 to 14 hours on the phone dealing with this one trip because of so many things getting messed up and changed yet no one cares enough to do anything about it. We’re obviously carnival fans if we cruised enough to make it to platinum but after all the troubles we’ve had with the last several cruises I think we may just think twice before going through all this again. I booked a cruise in June for October 8-12 for myself, my husband and a child that we are raising that is not ours. We decided to take the cruise because my oldest daughter and her family were booked on the same cruise and we wanted to be able to take the child in our home on a vacation that was really memorable. The lady I spoke to on the phone when I booked the cruise had stated to me that she always insists that the vacation protection is part of the deal d/t things happening that may cause us to have to cancel. We found out in July that we would not be able to go on the cruise with the child d/t the custody issue and not being able to get him a passport. I called in July, which was within the period of time to get a full refund, to cancel the cruise and requested a refund. I was told we did not get a refund and that the $705.00 down payment was not refundable, even after I was forced to purchase the vacation protection in the event that we had to cancel. I was given a number to call for Aon Infinity, which handles the refunds. I received a letter the next week with a form to fill out, to explain the reasons for cancellation and other forms that are supposed to be filled out to receive my medical records (which I think is ridiculous because it is none of their business). I received a letter about 10 days later saying that my reasons for refund are not on their list of reasons to get a refund. I was given a letter saying that we could book another cruise for 75% off of the payment that we already made if we booked another one within a year. When I called the Cruise line back, I explained to them that we still would not be able to take the child with us and that was the main reason that we booked it in the first place. I was told that we could always leave the child with somebody else and go on the cruise without him. Over the past four years of having him in our home, we have had maybe 4 days that we have not had him with us d/t having nobody to watch him. I wouldn't want to go without him anyway. I know for a fact that no money was lost by us cancelling because my daughter's friend and her family booked in our place on the day that we cancelled. When I called back, I was told that the deposit was put back on my husbands credit card and it was not. When we called the credit card company we were told that no deposits were made to the account. When I contacted Carnival again about the deposit not being made to the credit card, I was told that it wasn't their problem and I would have to straighten it out myself. I am not sure how Carnival can justify STEALING the better part of a thousand dollars for a service that was never provided. I guess that initial phone call to book the cruise was worth $705.00. I am so upset with Carnival employees for how badly I was treated and how badly they are treated by the corporate offices. I can't believe you are firing all those workers right before the holidays and have them train foreigners on their jobs for a lesser wage. Does this mean your cruises are going to drop in price? I doubt it! We have done numerous cruises with Carnival, I'm not sure if we will do anymore. This is ridiculous what you are doing. On the Liberty Thurs, Oct 27. The ship left late, a woman broke her ankle so we returned to Galveston,, Trying to make up time, the ship was rocking so much u had to hold onto something. Very hard to stand or walk. The generator controlling the max speed blew. Did not arrive in Cozumel until 1:45 pm. We arrived in Galveston around 5:45pm instead of 8:00am. Very long time waiting to get off ship. Etc. I live about 45 minutes from Galveston and finally got home at 9:00 pm. The service was not good and food was ok. Very nice waiters at night and our cabin steward was very good and very nice. The temp in our room was comfortable but not very cold at all. I was in room 6385.
i was aboard the carnival magic it was the worst cruise I have ever taken. I am not sure ill be taken another carnival cruise ever my wife and i was rudely treated at the casino bar. Our room stewards were terrible, my cabin had mold growing around the tube and was all over the tub stopper. The smell of raw sewage 5 of the 7 nights aboard caused us to be ill because of it and all I was offered was strawberries. The Cloud 9 Spa lies to their customers will not give them documentation on the procedures. They're given by a so-called doctor that does not give any certification to prove she's a doctor lies through her teeth and charges you $700 for nothing you try to talk to cruise. They send you to the spa and they run you around and around you spend most of your time being manipulated on the ship going to supposedly free facials and stuff when it's actually just a ploy to get you to spend money in their overpriced Spa. I go to relax and enjoy myself and now on Carnival Cruise. Everyone is getting in your pocket dipping in your pocket you cannot relax and have a good time without them wanting more money the food is awful the people that work there are good but they work for nothing customer service. The line is usually about 15 to 20 people long because there is no satisfaction on the ship. Everyone has problems and they just try to pacify you until you get off of the ship they charge what they want on your credit card you do not get a receipt from them for these astronomical charges then when you ask for documentation. They just put you in circles this Cruise Line has really went downhill. We recently booked our 5th cruise with Carnival Cruise Lines. Because we own and manage 3 businesses, we often have to change or cancel our vacation plans, so we always make certain that any plans we make are fully refundable, and what the cutoff date is for a fully refundable cancellation. We did so with this cruise. Our plans did change, and so we called on October 19th and spoke to Alexis Green, a customer representative, and asked her to cancel our cruise and issue a refund. She refused to do so, citing that this cruise we signed up for was a special offer and therefore non-refundable. We told her that could not be, because we asked about the cancellation policy before we even booked the cruise. She would not budge, and became disrespectful toward my wife, saying things like, “You need to learn to take responsibility for fully reading your documentation.” I then promptly issued a call to my credit card company to dispute the charge and have it removed. We have been loyal customers of Carnival for 15 years. But like most companies, they've taken the low road, offering a “little less” and charging a “little more” each year. We will certainly not be sailing any more “fun ships” with their company. First I will make a statement; We took a cruse on Carnival Fascination 01/21/2016. KNOW YOU cant do anything about the very bad weather we had ,the first day we could not dock because of the weather at Freeport. So the next day we docked at Nass. we could not do any thing there because of the wind.Also the food at the evening dinner was terrible and cold.There wasn't much to do on the ship except drink boose which we do not drink. Now the reason I'm writing is the problem with water in our room. Friday the 22nd of FEB around 7:30 AM we attempted to take a shower. Before we could cut off the water the bath room was full of water and ran out on the carpet outside the shower room. I called the guest care department several times about this problem. At about 10 AM someone showed up and called a plumber. He unstopped the drain which was full of sand.Then we had to wait for someone to clean up the water and sand this was around 11:30 AM. WE finally were able to shower and dress, this was around 1 PM Then they came in and used a vacuum to get the water out of the carpet.We missed 2 meals on account of this. When we returned to our room there was a fan blowing and a terrible smell in room. the house keeper sprayed something but didn't help much. I asked to be moved to another cabin and told none was available. WE stayed out of the room until after midnight. On returning we cut off the fan too (much noise) but the smell was still there. I think we are due a refund for this trip. Or given another cruse trip. Carnival Cruise Lines has the best to offer for any kind of vacation. Numerous ships and itineraries to pick from with extensive selection of onboard amenities and activities and a variety of dining options. Food is fare in quality and variety. This was a new ship, very clean and well kept. Decor was extremely well planned. Everyone was having a great time! We had the ocean view deluxe and were surprised on how much space we had. There was dancing and music all the time. We thoroughly enjoyed every minute and it was a true value for money. Carnival Cruise Lines truly know what they are doing when it comes to cruising. I would highly recommend this to anyone planning to go for a vacation. I have been on Carnival Cruise Lines several times but never really considered them a top of the line company. You get what you pay for but in the end this place attracts the lowest common denominator if you get my drift here. Next time I'd like to try one of the nicer cruise lines. Went on a 5-day out of Miami and it was a lot of fun. The people at times though just seemed really cheap. 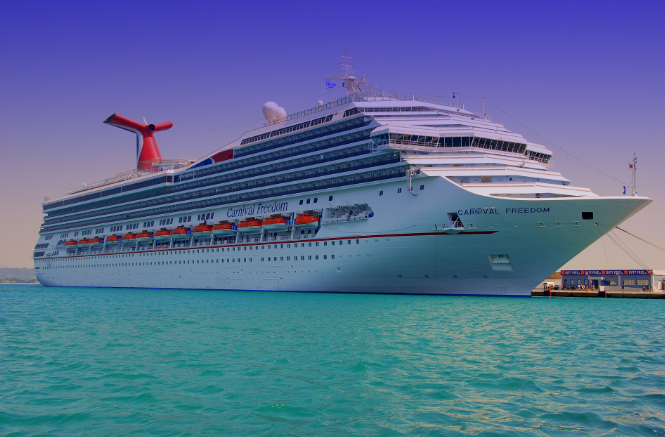 Have feedback for Carnival Cruises?